The NDP and Jack Layton are up in the polls. Multiple polls have confirmed it so we can now conclude it is real. 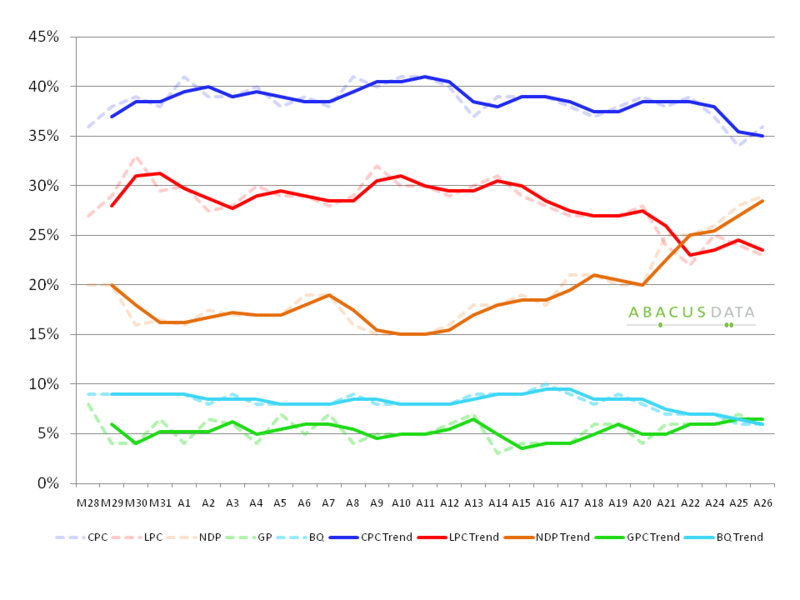 The trend chart (averages 2 days of all polls released) below shows that while their support dipped early on in the campaign, the NDP quickly surpassed the Liberals and their growth continues (reaching 30% in Angus Reid’s recent poll). Obviously there will be plenty of punditry on whether it will stick, whether the quality of candidates and local campaigns will mute the wave, and what impact the party’s growth in support will mean for the other parties and for the make up of Parliament when the election is over. Instead of joining in that debate (I’m not a pundit and I don’t do seat projections), I thought I’d use some of our data to explain why I think the NDP has grown. Voting behaviour is a complex decision that is driven by no one single factor. However, we know from academic research that on average, a Canadian’s decision about who to vote for is driven by their pre-existing partisanship (if they have any), their agreement with party issues, their affinity for the party leaders, and the influence of the local candidates. There are certainly other factors at play but let me focus for a moment on party identification or partisanship. Although academic research has shown that the strength of partisanship in Canada has declined and Canadians seem to be more volatile in describing which party they feel “closer” to, I’m a firm believer that most voters (and I stress the word voters because non-voters are far less likely to be partisans) start off feeling closer to one party than an other. This is usually caused by family tradition or socialization effects (when a new Canadian immigrated to Canada or in the era in which an individual grew up). It has been shown that generally speaking, Canadians do identify with one particular party, but that the number of people who say they are “independent” has grown. So in 2008, the Liberal Party and the Conservative Party had a clear lead over the other parties but neither have any real advantage over the other. These numbers may have changed in the last two and half years, but not enough to fundamentally alter the starting point of this election campaign. Ultimately, an election campaign is really focused on the 28% of Canadian voters who identify with no party or for soft partisans, those whose attachments are weak. Partisanship or party identification does not explain all variation in voting behaviour – but it helps to give us a sense of where the teams are at the beginning of the season (to use a sports analogy). Voting behaviour is also formed out of habit and we know that a large percentage of voters are consistent in their vote choice from one election to the next. This is driven by national factors but also by local factors like the popularity of an incumbent MP (incumbents, on average, usually get a boast of about 5% thanks to incumbency). So now to the main research question of this post: How does the NDP go from about a base of 10% (partisans) to the high-twenties in the polls? Jack Layton is the most popular federal party leader in Canada. Not only does he lead the other leaders, but he is way ahead in terms of favourability. 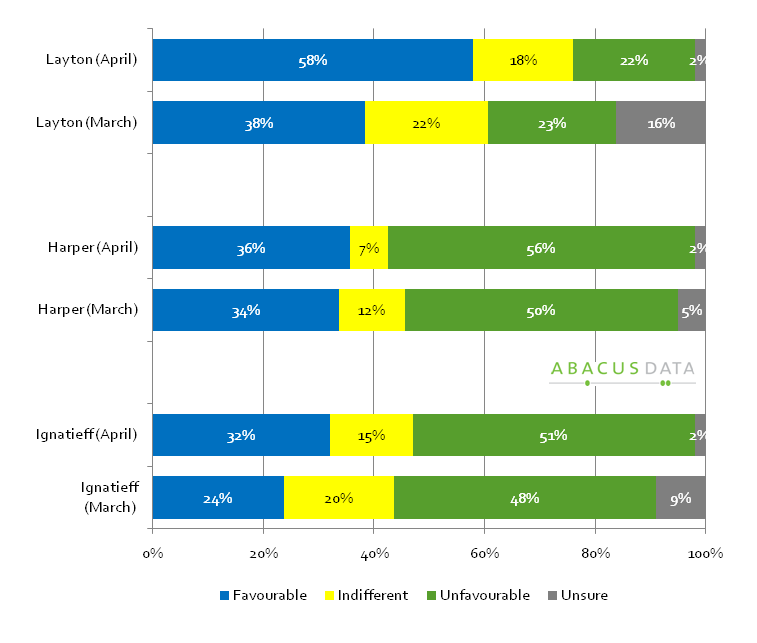 An Abacus Data poll done last week found that 58% of respondents said they had a favourable impression of him, 20-percentage points higher than Stephen Harper and Michael Ignatieff. Although I’m a stickler for the local-side of politics, I can’t deny that affinity for a party’s leader will positively effect the probability of a vote cast for the leader’s party. What’s more, Layton is extremely popular in Quebec – more than even Gilles Duceppe. His personal appeal crosses party lines, age groups, gender, and regions and is FUNDAMENTAL to the NDP’s rise in the polls. People have to like you before they will consider voting for you. Jack Layton has been able to replicate the positive feelings that Ed Broadbent was able to cultivate near the end of his tenure as leader. For both leaders, time allowed each to build a relationship with Canadians and it paid off at the polls (the NDP won 43 seats and 20% of the vote in 1988, Broadbent’s last election as leader). In the last Ekos poll, which found the NDP at 28% nationally, 36% of the NDP’s national number is a consequence of its strength in Quebec (at 38% in the Ekos poll). In contrast, the Conservative vote in Quebec only accounts for 12% of the Tories’ national numbers. So the NDP’s rise in the national polls is largely a function of their rise in Quebec. So what explains “the orange crush” in Quebec? Politics does not operate in a vacuum and popularity is often relative. In the case of the NDP and Jack Layton, they are fortunate to be running against two national party leaders who are extremely polarizing and largely disliked in Quebec. Although the Conservative Party has maintain support in the 33% to 40% range since being elected in 2006, it has not been able to rise about the 40% threshold and sustain it for long periods of time. This has happened despite a very positive economic performance coming out one of the worst global recessions since the great depression. The Conservatives have hit the “Harper Ceiling”. While the party and its performance on certain economic issues has been well received, Stephen Harper is disliked by a large percentage of Canadians and this is hurting the party’s chances at obtaining the majority they seek. The Liberals on the other hand have selected two subsequent leaders who have failed to connect with Canadians and whose brands have been effectively destroyed by Conservative advertising. While Ignatieff’s personal favourability rating has improved over the course of the campaign, he still trails the Prime Minister and Jack Layton nationally and is only slightly ahead of Harper in Quebec. Add to this the fact that Canadians attribute very little policy strengths to the Liberal Party and what you have is a party whose leader is disliked and not trusted coupled with party policy that seems incoherent to a large portion of the electorate. In Quebec, the situation for the Liberals is compounded by the continuing harm the sponsorship scandal has done to the party’s brand. In a recent Abacus Data poll, 53% of Quebec respondents agreed that they haven’t yet forgiven the Liberals for their past scandals while only 25% disagreed. Only Alberta was less forgiving and we know how well the Liberals do there. Finally, there’s the BQ. Gilles Duceppe remains relatively popular in Quebec. But, a majority of BQ voters identify the NDP as their second choice so there is a clear opportunity for the NDP. Moreover, in the same Abacus Data poll mentioned in the previous paragraph, we asked whether respondents agreed or disagreed that it doesn’t make sense to vote NDP because they cannot form government. Quebec respondents were the least likely to agree (31%) and this was asked before the party’s sudden surge in the polls. Let’s remember, many Quebec voters are used to voting for candidates and parties who have no chance of forming government. So Quebec seems, at least in the underlying data, a ripe opportunity for NDP growth. But here’s an additional layer to my theory: Has all the talk about coalitions at the start of the campaign actually laid a foundation for NDP growth in Quebec? The BQ has clearly stated it won’t join in a formal coalition with any other parties. And no party has said it would want BQ members in cabinet. Perhaps Quebec voters have decided that although the BQ has done a good job at representing Quebec in the past, it really can’t prevent a Stephen Harper majority. In fact, voters may have figured out that by electing NDP MPs they can actually prevent a Harper minority – by giving the NDP enough seats in Quebec to form a working arrangement with the Liberals elected outside of Quebec. Fewer BQ seats in Parliament means that the math becomes more palatable for Canadians because the real problem with coalitions was not the principle of a coalition but the idea of separatists holding a government hostage. The Liberals are not a reasonable alternative to the BQ because the shadow of scandal still hangs over the party. So the NDP is the only real alternative. We asked people what outcome they would most prefer (we did not release the results). We prefaced the question by saying that the BQ would definitely not join a coalition. We found that in Quebec, when given the choice between a Conservative minority government and a coalition or agreement between the Liberals and NDP, 57% of Quebec respondents preferred a coalition while 29% preferred a Conservative minority. 14% were unsure. An Angus Reid poll released today found that 61% of Quebec respondents believed that “The Conservative government has performed poorly, and does not deserve to form a government after the next election” – the highest percentage in Canada. So what we may be seeing in Quebec, and the data backs up this argument, is that Quebecers have realized that they can prevent another Conservative government not by voting BQ, but by voting NDP. If this is true, what we could be witnessing is a collective decision to vote strategically from a large part of a provincial electorate. 1. Will voters actually show up and vote NDP despite inexperienced and unknown candidates and weak local campaign machines in many constituencies in Quebec and elsewhere? 2. Will the NDP’s surge in Quebec have ripple effects across Canada? I have said this many times before – if the opposition parties were able to coordinate voters who are opposed to Stephen Harper and the Conservatives, they could threaten his lead. Are we starting to see that coordination, even from an unlikely catalyst? Who said this election was going to be about nothing? It could turn out to be the most important since 1993.